One can rightly say of Peter Sloterdijk that each of his essays and lectures is also an unwritten book. That is why the texts presented here, which sketch a philosophical physiognomy of Martin Heidegger, should also be characterized as a collected renunciation of exhaustiveness. Sloterdijk also considers several other crucial twentieth-century thinkers who provide some needed contrast for the philosophical physiognomy of Martin Heidegger. A consideration of Niklas Luhmann as a kind of contemporary version of the Devil’s Advocate, a provocative critical interpretation of Theodor Adorno’s philosophy that focuses on its theological underpinnings and which also includes reflections on the philosophical significance of hyperbole, and a short sketch of the pessimistic thought of Emil Cioran all round out and deepen Sloterdijk’s attempts to think with, against, and beyond Heidegger. Finally, in essays such as „Domestication of Being“ and the „Rules for the Human Park,“ which incited an international controversy around the time of its publication and has been translated afresh for this volume, Sloterdijk develops some of his most intriguing and important ideas on anthropogenesis, humanism, technology, and genetic engineering. 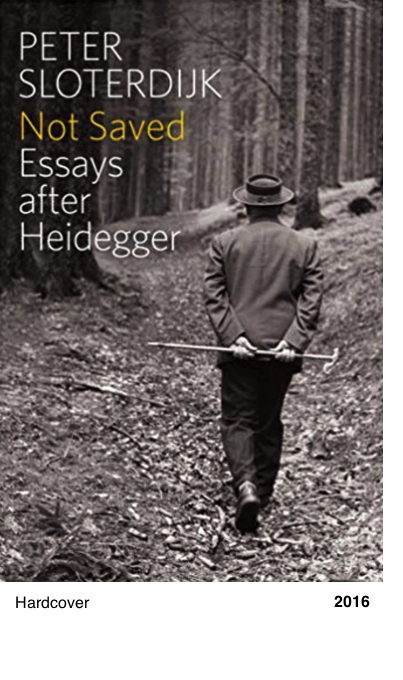 With his usual flair, philosophical finesse, and dazzling scholarship, Peter Sloterdijk shows us what it means to read Heidegger today, beyond accusation and apology. At a time when so many have decided to turn away from his thought, Sloterdijk teaches us a lesson in how to think with, but also after and beyond Heidegger. Not Saved is an impressive collection of essays, which touches expertly and delicately on a wide range of contemporary issues, such as globalization, technology, and the post-human condition. It will be discussed for many years to come.